Everyday 11.5 children are diagnosed with some form of a pediatric brain tumor. This figure equates to approximately 4,200 children each and every year. In the fall of 2012, a two year old little boy named Grayson became part of that statistic. 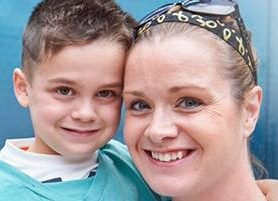 Vivacious and spunky, this child, who loves Transformers, Batman, Spiderman, and all things trains was diagnosed with a Medullary Fibrillary Astrocytoma. Grayson was diagnosed with a form of pediatric brain cancer. Grayson’s tumor is enmeshed within his brain stem, the powerhouse of the brain, and entwined within the nerves that control major gross and sensory reaction such as breathing and swallowing. In January of 2013, Grayson began, what would total, 18 months of weekly Chemotherapy at Children’s Hospital of Philadelphia (CHOP).